I was poking around my express tools and found one that I think is very useful. 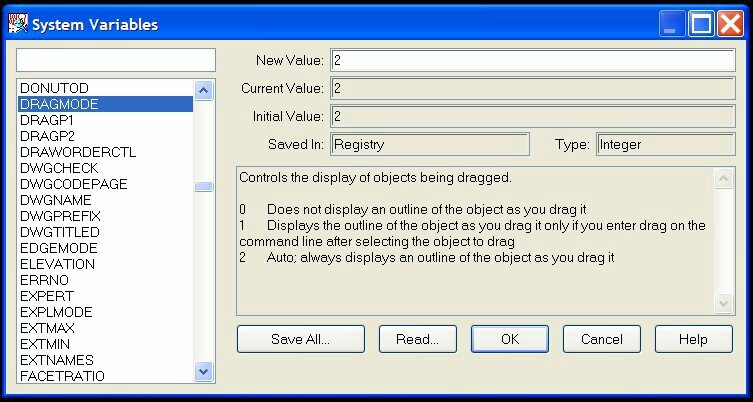 It allows you to check and change a system variable via a dialog box. Just type in SYSVDLG after loading the Express Tools. You will get a dialog box listing all of the system variables. This dialog box will show you each system variable one at a time and you can review them or change them (unless they are read only). It will show you where each is stored and the type of data needed. It also has a brief description of the variable. You can scroll down or type in the variable in the box at the top. It is a very useful tool. 1 Comment To "AutoCAD 2006 Express Tool – SYSVDLG"